Encanto Pet Clinic moved from its original location into its current location in November 1999. Dr. Ireland and Tina Ireland chose the new location and designed the clinic to allow progression and expansion. 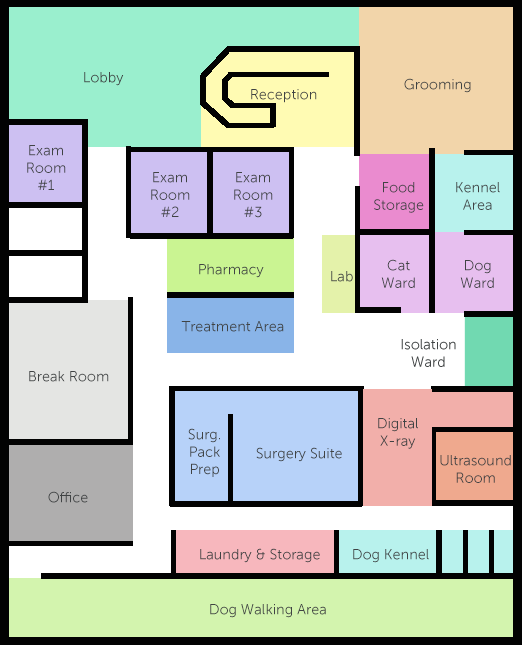 Our facility houses patient exam rooms, a state-of-the-art surgical suite, digital radiography, an in-house laboratory and pharmacy, as well as grooming. Click on our rooms below for a peek into our hospital! Our saltwater aquarium is a favorite of all ages. Welcome to Encanto Pet Clinic! This is the place to bring your pet for pampering. From nail trims to full groom, Treva can do it all. Room 1, mostly cats, room 2, larger dogs, and room 3, smaller to medium dogs. We are able to perform lab work if we need immediate results, or process samples to send to the veterinary reference lab. Most of our treatments for patients are performed in this area, along with teeth cleaning and other procedures. We have an extensive pharmacy to provide our patients with immediate access to medications and provide convenience to pet owners. Cleaning and sterilization of medical equipment is extremely important for the health of our patients. Our sterile surgical procedures are performed in our surgical suite. We have state of the art digital x-ray imaging to aid in diagnosing issues with pets. A quiet, dim area to perform ultrasound exams. Larger dogs will have plenty of room to spread out while staying with us. From small to large dogs, we have housing to make their stay comfortable. Reserved for cats only! Cats who are intimidated or frightened by dogs really appreciate their own space. This area is for pets who have potentially infectious diseases and those we need to keep a closer eye on while in the hospital. Our area for dogs to relieve themselves and stretch their legs while staying with us. We carry Royal Canin and Hills Diets for cats and dogs. We provide a towel or blanket for both dogs and cats while staying with us, so we have lots of laundry. We all need a break during the day. Practice manager and doctor’s office.